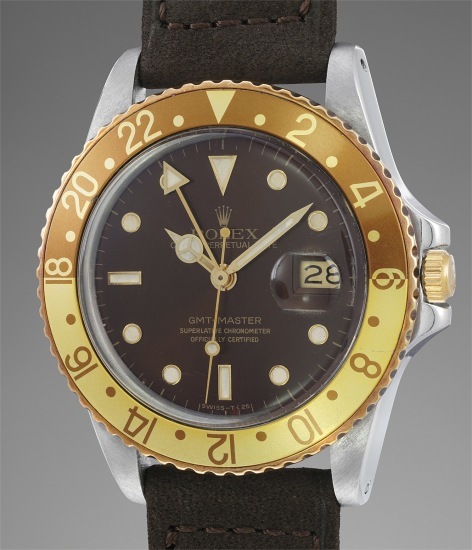 Model Name: GMT-Master "Root Beer"
Reference 16753 is a rare variant within the GMT family as it is cased in both stainless steel and yellow gold. Collectors dub this model the 'Root Beer' due to its beautiful brown dial and caramel and chocolate bezel. This particular bezel remains vibrant, displaying a sharp gold and light brown color, giving the watch a very charismatic appearance. This timepiece is preserved in particularly stunning condition, with sharp satin finishes on the top of the lugs and crisp edges. The proportions are robust, and the bevels are wide and visible. Even the case back retains a strong satin finish. The dials of reference 16753 are known for flaking, yet this dial remains intact throughout and exhibits a glossy brown shade, which is particularly noteworthy and incredible.